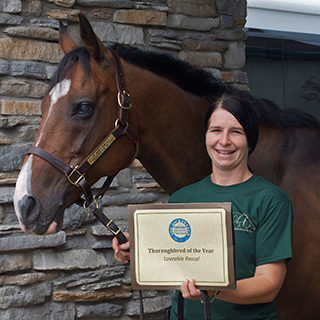 Our amazing therapy horse, Loveable Rascal, was named Thoroughbred of the Year by The Jockey Club T.I.P. and Fieldstone Farm received $5,000 on his behalf. Congratulations Rascal! Everyone at Fieldstone Farm is extremely proud of this incredible horse. He has helped so many students over the years. The award was officially presented at Thistledown race track.